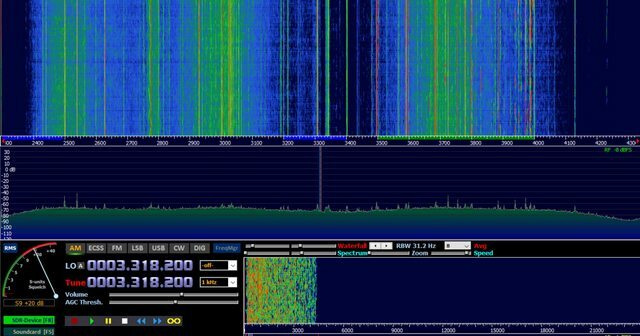 I am in Southern Nevada and finding QRM spikes on my SDR that are also present on other SDRs in area (Southern California, etc). I am can see these noise signatures above 15000 KHZ spaced somewhat evenly all the way through 50000 KHZ. When tuned in AM, it is like a rushing sound - every one sounds the same. 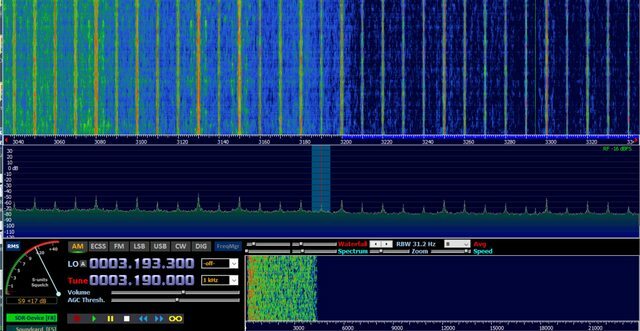 The QRM is always present across multiple antennas and geographically distant SDRs. I see the same QRM on a California SDR at exactly the same frequency. It appears day and night. I would like to know the source of this QRM. Perhaps a natural source? Equipment / Re: RA0SMS vs PA0RDT Active Mini Whip - RA0SMS is Very Noisy - Why? 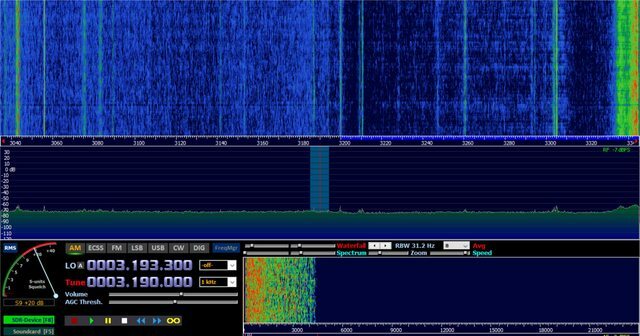 Equipment / RA0SMS vs PA0RDT Active Mini Whip - RA0SMS is Very Noisy - Why? 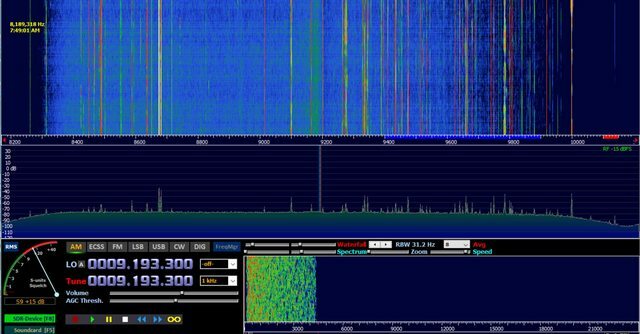 How does the KiwiSDR compare to the SDRPlay RSP2? Josh, yes, I have a digital multimeter. I noticed that on 80 and 60 meters, the loop is comparable to the active mini-whip for amateur stations in California, Arizona, and Northern Nevada - I am in Southern Nevada. So 'local' stations are pretty much the same but elsewhere across the bands, the mini-whip outperforms the loop 10 out of 10 times. p.s. I am going to have some inexpensive fixed value matching transformers for sale shortly, suitable for LoGs and other antennas. Count me in. How will you announce availability? I bought a Palomar Engineers MLB-2 Long Wire antenna matcher (9:1) balun (100KHz-30 MHz). I'll use this once it arrives. The coax is good, brand new in fact, but I'll try another one to test it. The eaves are wooden, the wire stands off the wood by 1 inch (via ceramic insulator), and runs around the perimeter of the house. There are some spots where the noise floor is higher while others it is lower. Signals like WWV @ 5000 khz are strong with the active mini whip and nearly imperceivable with the loop. To me, it is very odd. I didn't expect such signal loss. It is almost like I do not have an antenna attached in HF. I'd use both wires in the pair as a single conductor, but it'd be fun to see how the loop fared with two turns instead of just one. I'll give the 'both pairs as a single conductor' a shot this weekend, in addition to a different connection from the coax to the antenna wire. The coax is new but my homebrew connector is about 15 years old. Heck, I should be able to use a clip to connect the conductor and ground to the coax to see what happens. Not sure about the double run loop. Considering the second run of wire would be running parallel to the first run, wouldn't there be a coupling problem? It would be twice as long electrically but it will share the same stand-offs attached to the wood trip. The mini whip power supply is in the shack (the dining room table ..) next to the radio and laptop. I have tried ferrites but it didn't seem to help, or at a minimum, had no material effect on the signals visible in the SDR waterfall. The mast is 10 feet of galvanized steel fence post with a 10 foot section of PVC clamped to it (wooden dowel inside for strength). The active antenna sits at the top of the PVC. What amazes me is that this little antenna in Las Vegas, NV is capable of receiving NDBs in Montana, Canada, and Oregon in addition to XSG, HLG, HLO, HLF, and HLW Coastal Radio markers when the conditions are favorable. Not bad if you ask me, but as a novice, perhaps something everyone can do. The active antenna is great, awesome for me in fact, but I would like a working alternative to compare results. I was hoping the loop would be effective; sadly, it is not. I have been using an active mini-whip antenna (PA0RDT) at approximately 20 feet on a non-conducting mast. From my QTH, the mini-whip has been exceptional for RX. Over the weekend, I ran a wire around the house under the eaves, approximately 200ft of wire @ 10 feet or more off the ground. As a loop, the coax braid connects to one side and the conductor to the other. It is two conductor alarm wire and I am only using one in the pair. No balun, just a simple PL-259 connector connecting the conductor and braid to the wire. The mini-whip wholly outperforms the loop antenna. Strong signals present on the mini-whip practically disappear with the loop. On a scale of 1-10 for RX, the loop is a 1 or 2 compared to the mini-whip. Using the loop is like not having an antenna at all. As a novice, I thought for sure, the long wire around the house would be at least as good if not better due to the electrical length. Not at all. Can someone help me understand why the mini-whip @ 20 feet is outperforming the 200 foot loop @ 10 feet? 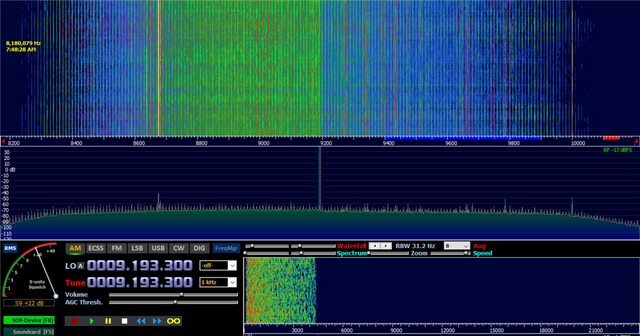 General Radio Discussion / Re: Decoding Digital Signals - How do you ID the Signal Type? Josh, thanks for the thorough reply. With my SDR and active mini-whip antenna here the SouthWest, I routinely and consistently can find STANAG and what I call FSK like signals with the 'twin towers' or left and right peaks. On any given day, I can find at least 20-30 similar signals and I would like to at least start somewhere. With FLDIGI, MultiPSK, or Sorcer, I don't know where to start. Decoding FAX and ACARS has been easy. The rest, not so much. If you don't mind my asking ... which software do you use for decoding?